Starting from the new moon day to the ninth day of Ashvina is considered as the celebration period for Durga Puja and it is the most auspicious time of the Hindu Calendar. 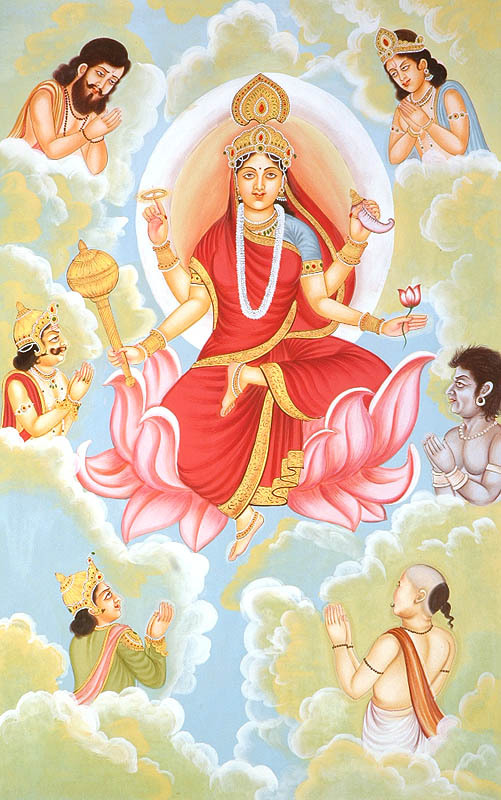 The nine different forms of Devi are worshiped over the nine days. 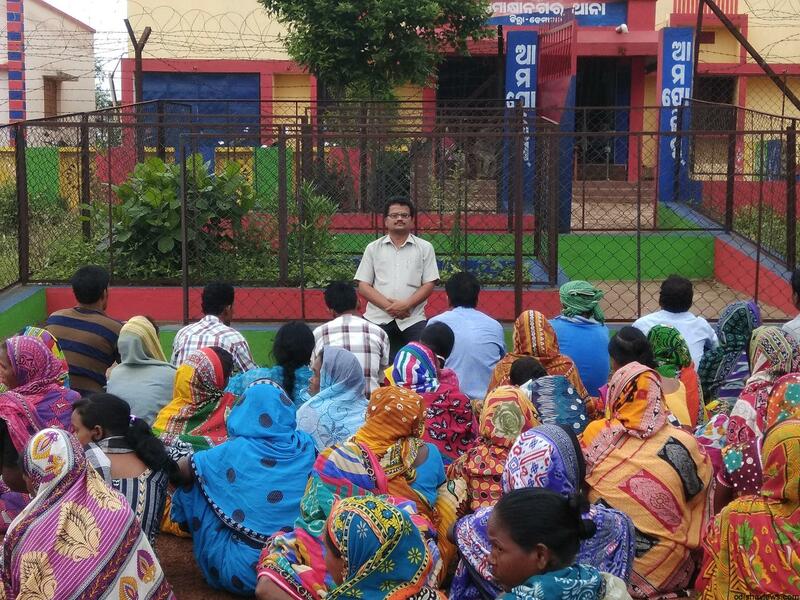 Worshipped in different form of “Shakti”. Three main forms of “Shakti” in the name of Shri Maha Saraswati, Shri Maha Laxmi and Shri Mahakali took place from Shri Brahma, Shri Vishnu and Shri Mahesh respectively. Each of these 3 deities gave rise to 3 more forms and hence in all, these 9 forms together are known as Nav-Durga. 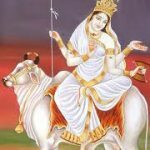 These are the most popular forms under which she is worshiped: Durga Shailputri (Daughter of Mountain), Brahmacharini, Chandraghanta , Kushmanda,Skanda Mata, Katyayani, Kalratri ,, Maha Gauri , Siddhidatri . 1st among nine Durgas and 1st night of Navratras is devoted to the puja of Shailputri . ‘Saila’ means ‘Mountain’ and ‘Putri’ means ‘Daughter. 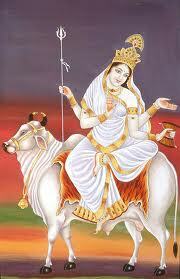 As she is a daughter of Himalaya and first among nine Durgas. Her two hands display a trident and a lotus. Her mount is a bull. She is worshipped as ‘Sailaputri’. 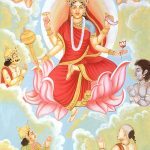 Brahamcharini is the 2nd Shakti of Durga. Brahma that is who observes penance(tapa) and good conduct. 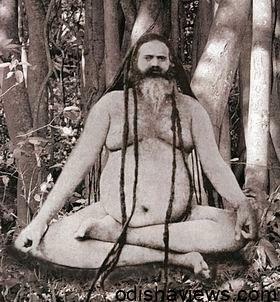 Here “Brahma” means “Tapa”. One hand hold a “Kumbha” or water pot, and the other holds a rosary. Bhramcharini is the store house of knowledge and wisdom. Rudraksha beads are Her most adored ornaments. She personifies love and loyalty. 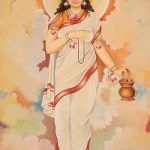 Brahmacharini is always depicted as pious women or Sannyasin. She is also worshipped as goddess Tara and is associated with the pious form of Goddess Shakti. 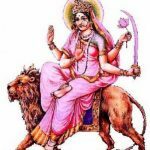 She is believed to be that aspect of Mother Goddess, which was present in Sati and Goddess Parvati, when they both did intense austerities to get Lord Shiva as husband. The 3rd Durga Shakti rides a tiger is Chandraghanta. 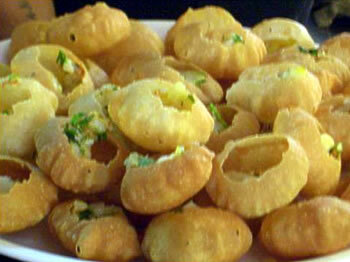 Chandra + Ghanta, meaning supreme bliss and knowledge, showering peace and serenity, like cool breeze in a moonlit night. There is a half-circular moon in her forehead. She is charmful and bright. She possesses ten hands, 3 eyes and Golden in color,. Eight of her hands display weapons while the remaining two are respectively in the mudras of gestures of boon giving and stopping harm. She is seated on Lion and ready for going in war to fight. She is unprecedented image of bravery. The frightful sound of her bell terrifies all the villains, demons and danavas. 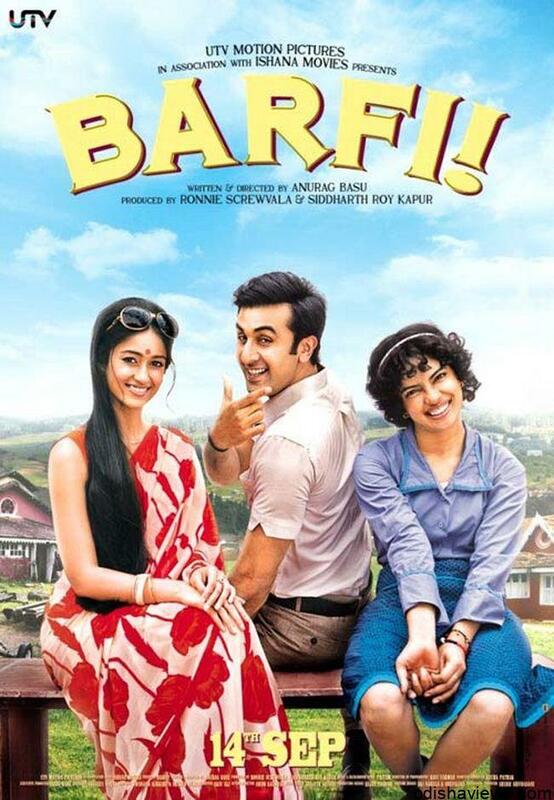 sharanye Tryambake Gauri Narayani namo’stu te. 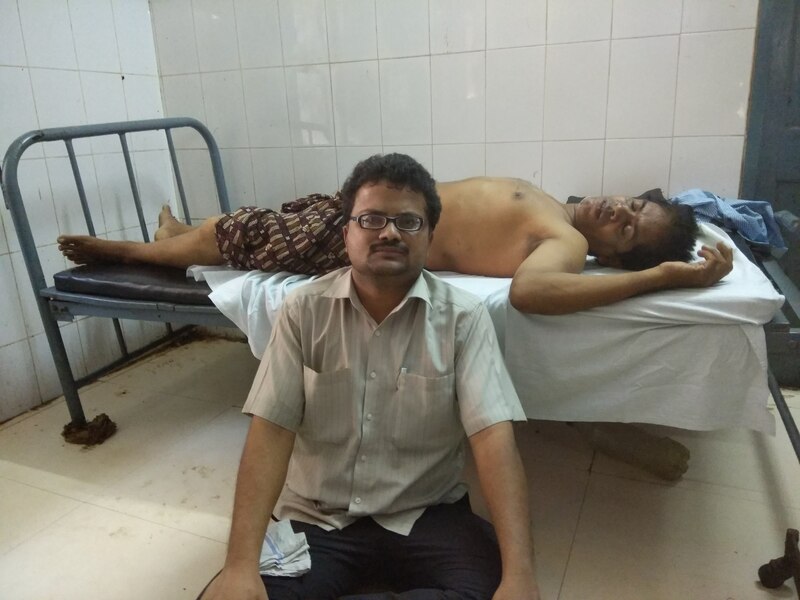 gunasraye gunamaye Narayani namo’stu te. 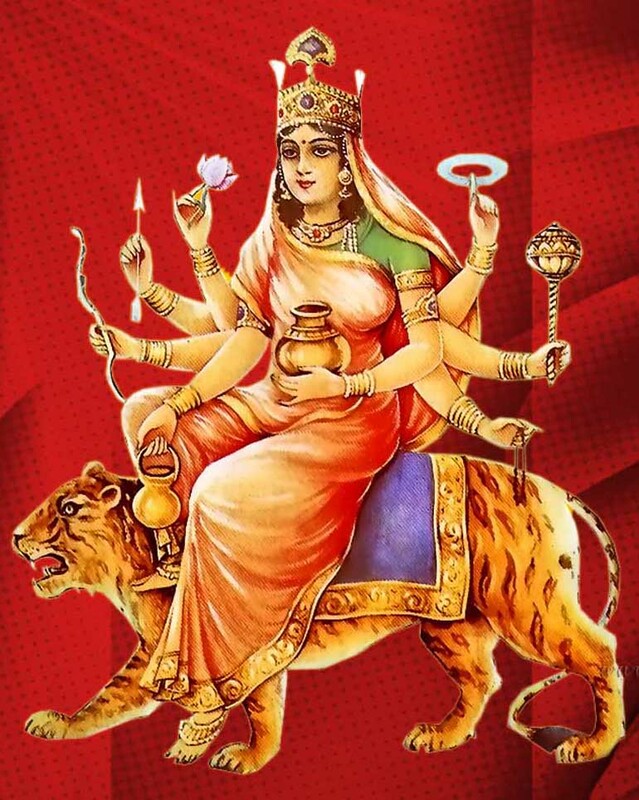 The 5th name of Durga is “Skanda Mata”. The daughter of Himalaya, after observing penance got married with Shiva. She has three eyes and four hands. She is white and seated on a lotus. Devi Maa is the mother of Kumara Skanda or Kumara Kartikeya also called Lord Murugan in south India. Kumar Skanda was chosen by Gods as their commander in “Deva-Sura Sangram” (the war of gods & demons) against the demons. Lord Murugan’s glory has been narrated in the Puranas and he is referred to as Kumara and Saktidhar. His vehicle being peacock he is also called Mayuravahana. 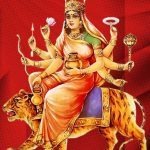 The 6th Durga is Katyayani. The son of “Kat” as “Katya”. Rishi Katyayan born in this “Katya” lineage. Katyayan had observed penance with a desire to get Paramba as his daughter. The legend behind her name goes thus: Once upon a time, there was a great sage called Kata, who had a son named Katya. Kata was very famous and renowned in the lineage of saints. He underwent long austerities and penance in order to receive the grace of the Mother Goddess. He wished to have a daughter in the form of a goddess. According to his wish and desire the Mother Goddess granted his request. 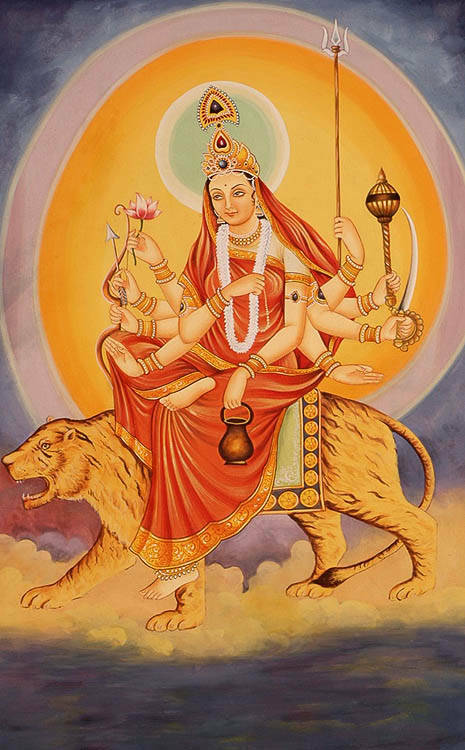 Katyayani was born to Kata as an avatar of Durga. Therefore her name is “Katyayani” . She has three eyes and eight hands. These are eight types of weapons missiles in her seven hands. Her vehicle is Lion. 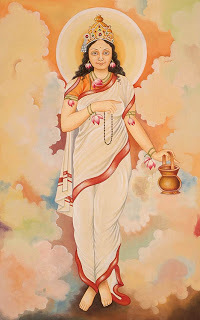 Her worship done with devotion and faith leads to four objects – Dharma, Artha, Kama and Moksha. 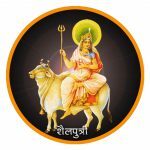 The 7th Durga is Kalratri. She is black like night. Durga hairs are unlocked. The complexion of Maa Kalaratri is like dark night with plentiful hair. She has four hands. The left two hands holds a cleaver and a torch, and the right two are in the mudras of “giving” and “protecting”. Her necklace is shining like thunder. Her three eyes emanate rays like lightning. Her nostrils throw fire when she inhales or exhales air. Her mount is donkey. Being auspicious she is called “Shubhamkari.” She is the most violent form of Maa Durga. 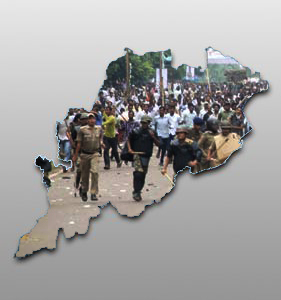 Kalaratriis one of the most aggressive and intense form of Maa Durga Kalaratri means “the Death of Kaal”. Here Kaal represents time & death. Maa Kalaratri destroys ignorance and removes darkness. Kalratri killed Raktabeej who was a demon who could multiply from every drop of his blood which fell on the ground. The Maa Kaalratri killed him by licking the blood before it could reach the ground and hence conquered him. She endows her devotees with calm and courage. & her appearance is very dangerous but she always gives blesses her devotees. 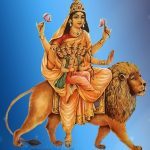 The 8th Durga is “Maha Gauri.” She is as white as a conch, moon and Jasmine. . Maha Gauri is intelligent, peaceful and calm. Due to her long austerities in the deep forests of the Himalayas, she developed a dark complexion. When Lord Shiva cleaned her with the water of the Ganges, her body regained its beauty and she came to be known as Maha Gauri, which mean extremely white. She has three eyes. She rides on bull She has four hands. The above left hand is in “Fearless – Mudra” and lower left hand holds “Trishul.” The above right hand has tambourine and lower right hand is in blessing style. She is calm and peaceful and exists in peaceful style. The goddess appears faithful, affectionate, calm and soft in nature. 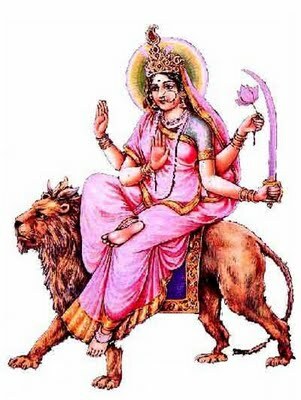 All the gods and sages worship this form of the goddess by chanting, “Sarva-mangala-mangalye Shive sarvartha-sadhike; sharanye Tryambake Gauri Narayani namo’stu te”. 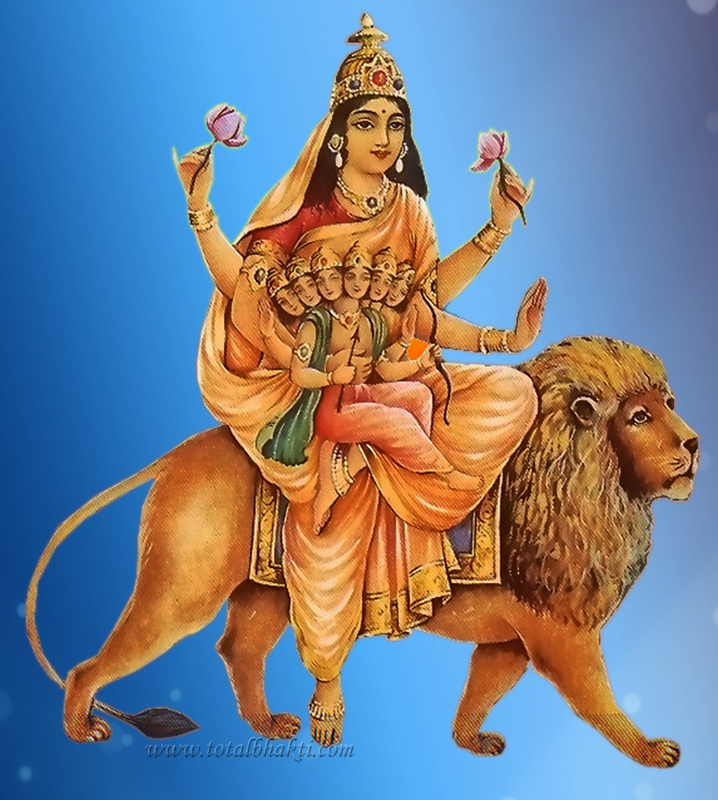 The 9th Durga is Siddhidatri. 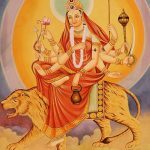 The Goddess Siddhidatri is capable of giving all sorts of occult powers and is also the possessor of 26 different wishes to grant her worshipers. All these achievements [Siddhi], which according to the Markandaye Purana:- Anima, Mahima, Garima, Laghima, Prapti, Prakaamya, Ishitva and Vashitva are 8 siddhis. As per the Brahmavaivart Purana there are 18 types of achievements which are Anima, Mahima, Garima, Ladhima, Prapti, Prakaamya, Ishitva,Vashitva, Sarvakaamaal, Saadhita, Sarvagynatva, DurShravana, Parkaayapraveshan, VakaSiddhi, Kalpavrushatva, Shrishti, Samharkaransaamarthya, Amaratva, Sarvanyayakatva, Bhavana and Siddhi. She has four arms and she is always in a blissful happy enchanting pose. She rides on the lion as her vehicle. She blesses all Gods, saints, yogis, tantrics and all devotees as a manifestation of the Mother Goddess. In ‘Devi Bhagvata Purana’ it is mentioned that Lord Shiva worshipped her and was blessed with all Siddhis (supernatural powers). By her blessings his half body became female and other half body male in the avatar of Ardhnarishvara. This form of Durga is worshiped by all Gods, Rishis-Munis, Siddhas, Yogis, Sadhakas and devotees for attaining the best religious asset.